This security poster illustrates the UMNOP-1 Fuze Yugoslavian Initiator. This multi-function fuze has equivalent functions to the series of Yugoslavian fuzes in one operational fuze. This security poster features the UMNOP-1 Fuze’s description, fuze body, striker, axial pull/safety pin, radial pull/safety pin, pressure, and pressure release. 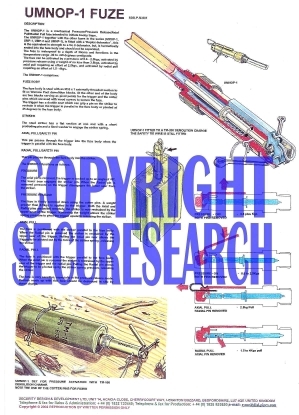 This security poster also shows illustrations of the UMNOP-1’s functions, a sectioned UMNOP-1, the UMNOP-1 fitted to a TM-200 demolition charge with the safety wire still fitted, and the UMNOP-1 set for pressure activation with TM-100 demolition charge. An UMNOP-1 and a sectioned UMNOP-1. The UMNOP-1 fitted to a TM-200 demolition charge with the safety wire still fitted. Illustrations of the UMNOP-1’s functions. The UMNOP-1 set for pressure activation with TM-100 demolition charge. The UMNOP-1 Fuze’s description, fuze body, striker, axial pull/safety pin, radial pull/safety pin, pressure, and pressure release. This security poster features the fuze's description, fuze body, striker, axial pull/safety pin, radial pull/safety pin, pressure, and pressure release, illustrations of the fuze's functions, a sectioned UMNOP-1, the UMNOP-1 fitted to a TM-200 demolition charge, and the fuze set for pressure activation.